Southerners love their greens. Though they might try new recipes from time to time, nothing is more comforting than the traditional pork-seasoned dish of turnip greens, kale, collards or mustard greens. And in true Southern tradition, greens must be served up with freshly baked cornbread for dipping with a side of pepper sauce (vinegar and small hot chili peppers). For some of us, the least enjoyable part of preparing fresh greens is getting all the grit off the leaves (though it's even more unpleasant to eat badly cleaned greens). The easiest way to clean them is directly in the sink or a very large pot filled with cold water. After the tough stems and heavy ribs are cut out and discarded, place the leaves in the cold water. Let them soak for a few minutes, then swish around to loosen grit and sand and drain. Repeat the process two or three times, depending on how gritty the leaves are. Even if you buy "cleaned" greens, swish them a time or two just to make sure. Whether you're looking for traditional Southern flavor or something new and different, you'll likely find something to try from the recipes below. Nothing could be more Southern than ham cooked with turnip greens. For this recipe, you can use ham shanks or leftover smoked ham if you happen to have some in the fridge. Serve with cornbread for a quintessential down-South dish. As we all know, everything is better with bacon—and Swiss chard is no exception. If you are a fan of spinach, you will love Swiss chard as these greens are very similar. A simple, one-pot dish, this recipe of greens, bacon, onion and Cajun seasoning is ideal for your next cookout. We all know dandelions are weeds, but did you also know they are a tasty and nutritious green? Sauteed with onion, garlic, and hot chili peppers, the dandelion greens will bring a punch of flavor to any meal. If you decide to pick your own dandelion greens, be sure to do so in an area that is not sprayed with chemical pesticides. Black-eyed peas and collard greens—can't think of a combination that sounds more Southern. After cooking the bacon, onion, and greens in a skillet, all of the ingredients are placed in a slow cooker and left to become a tender and flavorful dish that can be a main meal when served with a side of cornbread and tomato salad. The beauty of this recipe is it can be cooked in two different ways—ideal when you either are in a rush or have a bit of time to put dinner together. The first method is beyond simple, where you place all of the ingredients in a cast iron skillet and bring to a boil. Alternatively, you can saute the bacon, onion, and greens first and then add the chicken broth and seasonings to cook for 45 minutes. Ham hocks are an essential ingredient in Southern cooking. The ham hock (also called pork knuckle) is the shank end of the pig's leg bone and requires a long cooking time to tenderize the meat. 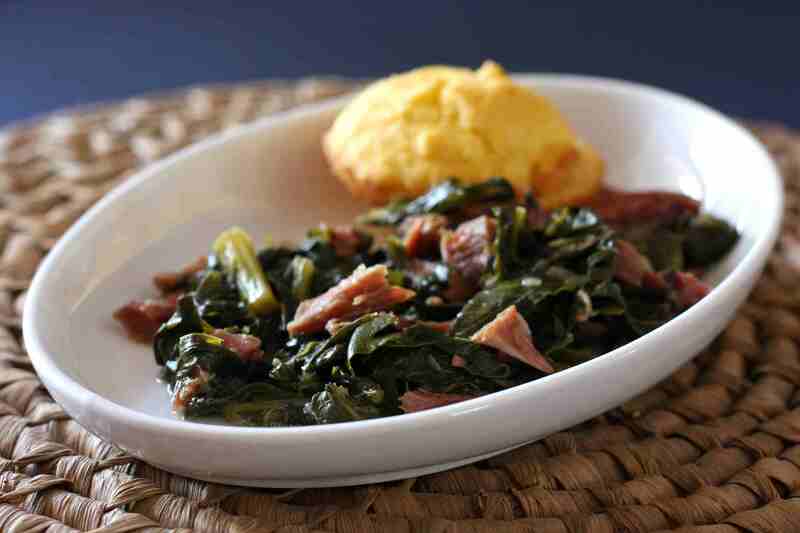 In this recipe, collard and turnip greens are cooked with the ham hocks to create a rich and flavorful dish. Don't forget to serve cornbread alongside to soak up the "pot liquor" left over after cooking. If you're looking for a way to spice up dinnertime, this greens and sausage recipe is sure to do the trick. The andouille or Cajun-style sausage contributes complex flavors with a bit of kick. An extra dash of Cajun seasoning makes this dish a spicy one, ideal alongside a cooling slaw and cornbread. In traditional Southern recipes, turnip greens are usually cooked with ham or pork. This recipe uses salt pork, which can be one of three cuts—pork side, pork belly, or fatback—that is cured in salt. The salt pork must be prepared before cooking by removing the salt coating, rinsing and then cutting off the skin and fat.